MediaPackBoard in Fredericton, NB. The Fredericton visit was unique in that no one knew that I would be arriving with the MPB. I set out onto the streets to ask people about the quality of life in that city. As an Artist, I enjoy getting out to meet people in ways that are not necessarily connected to the perceived realm of art, and I have always been interested in the idea of offering an outlet for the voices of Individuals. 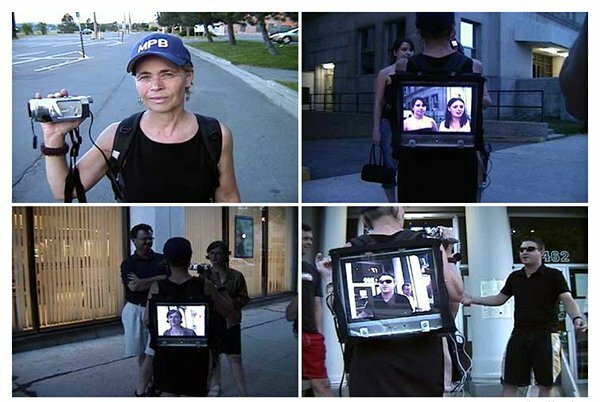 The MediaPackBoard is the title for both a performance assist apparatus and a series of performances based upon: encounters / conversations / video playback on city streets and in public transit during rush hour. The MediaPackBoard consists of a customized ‘backpack style’ rack on which a battery operated monitor screen plays back from a mini-dv camcorder. I handhold the mini-dv camcorder to record and to playback encounters. The ‘live’ encounter and/or playback is viewable to passersby via the monitor on my back. I venture out to encounter / converse and to playback videotaped conversations during rush hour and at outdoor public events, in short, wherever I might find a random, interested public. What does the MediaPackBoard look like? It will consist of a customized ‘backpack style’ rack on which a battery operated monitor screen will playback from a minidv camcorder. The minidv camcorder will be connected to the playback monitor and I will be carrying the camcorder to shoot handheld videotape. My performative approach / why the MediaPackBoard? As the pace of everyday life picks up and we are forced to pack more and more into the same 24 hour clock, I find myself less ready to wait for the chance to exhibit, to perform and to interact with audience. I have long favoured the chance encounter, the unexpected conversation of public performance. I enjoy stepping out to change the status quo of the street. I enjoy meeting people and giving them a chance to talk about things that do not usually come up in the routine of the weekday work regime. Like a food preparator in a grocery store, I appear with a prop that permits personal encounter. I prepare myself with some questions to invite my guest in, and if she or he wants to discuss something else, I am open to permitting that opportunity. Surprise, humour, and sometimes a serious conversation are all possibilities. How I ask the question comes through the cues gathered during the encounter: If someone is at first wary, I have to work to gain her/his confidence, to lure them into a chance to open up to the gift of essentially talking about things that are extremely important to individual existence and equally unimportant as earthshaking news items featuring human tragedy, oppression, political, natural and economical reports/disasters. I often find that all of the sensational news topics find their way into the conversations, but control of ‘what is said’ is given to the person encountered. It is an approach to performance that relies upon a random audience and permits that audience the choice of participating and becoming key performer on her / his own level. The encounters / conversations will represent a combination of mediated and real-time encounter / experience. It is a continuation and culmination of ideas brought forward through other of my works. In the Time Travel In This Moment (www.timetravelinthismoment.com), I was working with the concept that most of what we experience is mediated, brought to us through the Internet, through television and other dissemination tools. The MediaPackBoard combines that mediation with ‘face to face – real life’ encounters. As a performer, I continue to choose my location as ‘the eye of the camera, the ears of the microphone.’ I sometimes find my performative voice through animating my audience, inviting them to participate. How I ask the question comes through the cues gathered through the encounter. Specific subjects of conversation for the MediaPackboard Project will be decided upon closer to performance dates and will be based upon anecdotes of ‘meaningful’ life topics. The list might include: vacation memories, the value of personal and public time, meaningful work, handling stress, etc. For several years I have wanted to make the process of performing / exhibiting / disseminating move faster than the established gallery curatorial model. I see the projects that I take on as part of my oeuvre and I want to gain more control and freedom over their continuity. I see the MediaPackBoard as an infrastructure to work within over extended periods of time. In the future, when I do a project, I would like to continue to disseminate it using MediaPackBoard as soon as the project is ready to ‘go out’. I see MediaPackBoard as an evolution of the TRUNK© gallery; (see documentation Trunk gallery) with added mobility. No garage, fuel, licensing or insurance bills, I will go out on my own two feet to distribute ideas; to encounter audiences in public settings and in pre-arranged festival / art gallery events. Although there have been other portable galleries and wearable artwork, my intentions for use of the MediaPackBoard as a combination of high and low tech ingredients, set it apart as both apparatus and performance tool. It represents for me a unique opportunity to further my art practice while enabling my subject to become a key performer and / or performance collaborator. The object itself is both a mediation device and a conversation starter. I plan to get out 5 times a month from June through September for public interaction performances. As I will not need an invitation to arrive on city streets for the weekday rush hour, I will be able to carry out performances on my own, building up my audience. During weeks when there is a public outdoor event, festival or parade, I will make use of assembled audiences by including those events in my performance schedule. During the many public music, food and special event festivals that take place in Alberta each year, I will be able to wander randomly, inviting the public to ‘perform’ with the MediaPackBoard. The first time public performances of the MediaPackBoard were to accompany the ‘Free Market Karaoke’ audio presentations of Daniel Dugas at the Nova Scotia College of Art & Design in Halifax, NS; and at the Struts Gallery in Sackville, NB. These events involved seated audiences and I remained fairly stationary with the idea of enhancing rather than interfering with the impact of Daniel’s audio work.